Shoulder fractures include fracture of shoulder blade (scapula), proximal humerus or top of the upper arm bone, and the collar bone (clavicle). Most clavicle fractures can be treated non-surgically. However, a compound or severly comminuted fractur will require surgery. Surgery typically involves fixing the fracture with plates, screws or rods inside the bone. Fractures of the proximal humerus can be treated without surgery in case the bone fragments are not displaced. Surgery is usually required, if the fragments are shifted out of position. 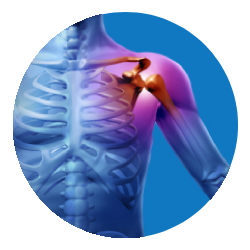 Surgery may involve fixing the fracture fragments with plates, screws, or pins; In some cases where there are multiple fracture fragments shoulder replacementis done. Most of the scapula fractures can be treated without surgery. Treatment involves immobilization with a sling or shoulder immobilizer, icing, and pain medications. About 20% of scapula fractures may need surgery when they are associated with proximal humerus or clavicle Fractures. These fractures are fixed with plates and screws.